I bought this small sized white jade face bead/pendant from China. It is only 2cm x 1.3cm. 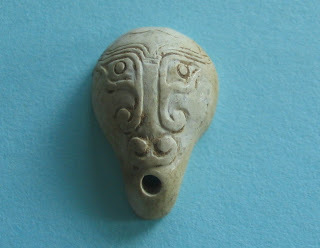 The beancurd white color of the bead resembles Liangzhu Culture (3400-2250 BC) stuff, but I have never seen anything from that period which is so tiny as this bead pendant of mine. Nor in this type of design or form. The eyes are also not Liangzhu Culture eyes. But here I must quickly add that I have not had that much exposure to Liangzhu artifacts, just what I get from books and on the Net. Well if Liangzhu is ruled out maybe it is from another ancient culture. I have also tried the scratch test. Somewhere some collector had said that if the jade article scratches white then it is ancient. Not sure how accurate such tests are but I tried it on the back of mine and it scratched white. There are also minute grind marks in the small mouth aperture which are another sign of age. And what is that cloud pattern design above the mouth representing ? I thought it was the nostrils but Heng says it could be a moustache ! Ooh, cloud pattern as a curling moustache on ancient man ! That's a cool idea. As a collector I obsess about fakes and genuine all the time and this piece has given me endless hours of speculation. After writing the above post I came across a website on Liangzhu excavations, where tiny jade objects such as mine were described as inlays for swords and knives. So, whoopee ! Mine may be a genuine Liangzhu culture face bead after all !